Robert Thomas Purkey (July 14, 1929 – March 16, 2008) was an American right-handed pitcher in Major League Baseball known for his use of the knuckleball. 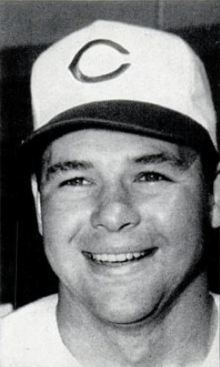 From 1954 through 1966, Purkey played for the Pittsburgh Pirates (1954–57, 1966), Cincinnati Redlegs/Reds (1958–64) and St. Louis Cardinals (1965). In 1974 he was elected to the Cincinnati Reds Hall of Fame. Born in Pittsburgh, Pennsylvania, Purkey signed with his hometown Pirates before the 1948 season. He reached the major leagues in 1954, but after four seasons in which he was used largely in relief, posting a combined record of 16-29, he was traded in December 1957 to the Reds for left-hander Don Gross. Installed in the Reds' starting rotation, Purkey enjoyed a great deal of success over the next seven seasons, peaking with a 23-5 season in 1962, finishing 8th in voting for the National League's MVP award. He had won 16 games with the Reds' 1961 pennant winners, and was named to the NL All-Star team in 1958, 1961 and 1962, starting the second 1961 game. He started Game 3 of the 1961 World Series against the New York Yankees, and pitched a complete game but took the 3-2 loss after allowing solo home runs by Johnny Blanchard and Roger Maris in the 8th and 9th innings. He was one of eight pitchers used by the Reds in the 13-5 loss in Game 5, pitching the 5th and 6th innings and allowing two unearned runs, as the Yankees took the Series four games to one. After his standout 1962 campaign, Purkey's record slipped to just 6-10 in 1963, and after finishing 11-9 in 1964 he was traded that December to the Cardinals in exchange for Roger Craig and outfielder Charlie James. Purkey alternated between starting and relieving in 1965, finishing the year with a 10-9 mark, and the Cardinals sold his contract to the Pirates a few days before the 1966 season began. He ended his career that season with 10 relief appearances for Pittsburgh before being released in August. Over a 13-season career, Purkey posted a 129-115 record with 793 strikeouts and a 3.79 ERA in 386 appearances, including 276 starts, 92 complete games, 13 shutouts, nine saves, and 2114⅔ innings of work. Following his baseball career, Purkey worked as a sportscaster for KDKA-TV in Pittsburgh, then opened a successful insurance business. Purkey died at the age of 78 in his hometown of Pittsburgh, Pennsylvania, following a battle with Alzheimer's disease. 1962: 23-5 and led NL pitchers with a .821 in winning percentage. His 2.81 ERA ranked him third behind Sandy Koufax (2.54) and Bob Shaw (2.80). He also was selected Player of the Month for May (5-1, 2.81 ERA, 34 SO).